This is a magnificent spoons. Feels almost like what it may have been like to walk into one of the exhibitions the Victorians would have put on to show off the wealth of Britain during the 19th century. One thing that also caught my eye is the fire place which is to the right of the entrance that is on parliament street. You enter and there is a raised platform with seating where you can survey those who sat lower down. There are also grand old stone pills along the stairs. The bar itself is down the steps from this raised platform bit in a large L shape with a lot of seating around it. There are at least 14 hand pumps but not all were on when i came in. The ales that were on were Abbot, Doom Bar, Ruddles Best, Phoenix Wobbly Bob, Saltaire No 5, Mammoth Epic Ipa, Isaac Poad 1863 best bitter, Yankees Rooster and Moorhouse's Black Cat. And a couple other pumps were dedicated to real ciders. I initially went for Black Cat but it was off, I pointed this out to one of the barmen and he found that it was bottom if the barrel so I went for the 1863 bitter, it was quite a solid beer and well kept and it cost me 1.99, however I'm not sure if this is the price of the guest ales or it was a special offer on Black Cat which he applied to my pint of 1863. A look of the menu said that guest ales start from 2.79, so by spoons standards in a non city centre, this is steep. But I assume they believe you are paying for the experience. It is certainly a grand place with a high raised roof that looks like something you may see in a grand old Victorian building. There are also posters around the building of advertisements for Harrogate as a spa town and history about the building. I would assume that in this wetherspoons, it never gets so busy that you will struggle for a seat. 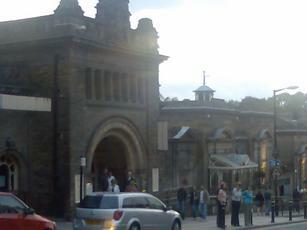 Definitely one to check out if on a shopping trip in Harrogate or before a night out or for whatever reason. A Sunday afternoon visit to this cavernous 'spoons in the Winter Gardens building. A stunning conversion into a pub with most of the original features either left in tact or restored, this is a stunning building. Was very busy but the place is so big there's a massive amount of tables, seats and standing area's. The long L shaped bar has 3 banks of hand pumps totalling 15, with at least 8 ales on and a few ciders. I went for a pint of Rudgate's Ale Storm @ 4.0%., well kept and very drinkable. Quick service from the many bar staff. 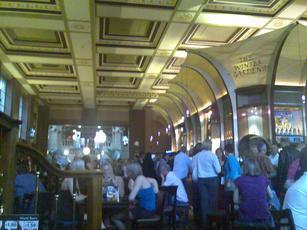 A very good 'spoons in a stunning building offering a decent range of ales. Another pub ticked from the GBG. Really interesting. Building dates from 1897, with a very large central bar. A spectacular building with great architecture. 10 beers available, including the usual Spoon favourites Adnams Broadside, Greene King Abbot, Ruddles Best Bitter and Sharp's Doom Bar, plus guests such as local Daleside brewery. Worth the experience. best spoons ive visited, as with most spoons a good selection of ale, but a bloody nice place to drink, wouldnt want to spend the whole evening there, with the old bell tavern 100 yards out the back. give it a visit.